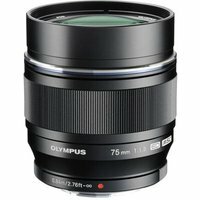 The Olympus 75mm f1.8 M.Zuiko PW EX Micro Four Thirds Lens features is an extra-bright, full-metal bodied prime lens that is designed to meet the needs of portrait, sport and low light photographers. The lens has been built with the Micro Four Thirds cameras in mind and features a smart design to live up to the beautiful, retro-styled OM-D and PEN series as well. Lightweight and compact, this virtually silent prime lens delivers edge-to-edge sharpness and a stunning blurred background thanks to its large f1.8 aperture. The Zuiko Extra-low Reflection Optical coating is twice as effective as conventional coatings, giving you the confidence to shoot in bright light without fear of ghosting and flare.